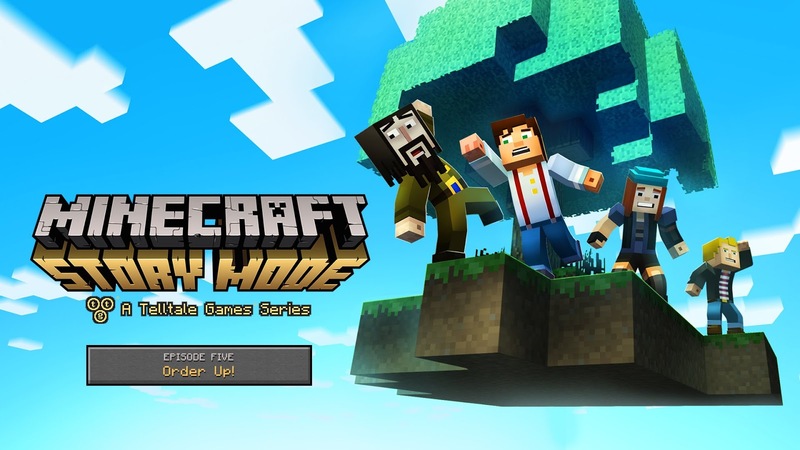 Minecraft: Story Mode has been a breeding ground for new experiments at Telltale Games. The fifth episode is no exception. Rather than an episode to wrap up the season, Telltale has instead created an episode that is all about a new story. The story of the old Order of the Stone had concluded in episode four, and episode five opens with the new Order of the Stone coming into their own with their new found fame and responsibility. This also has brought them some scorn from some of their peers. This jealousy brings a new danger to the world, and the team is split up in order to confront it head on before it’s too late. This split up gives the group a much different dynamic than before. The new Order of the Stone has been split in half. Jesse is paired with two people who are seemingly outside of the new Order, but who have worked with Jesse before. These two are the two who were deemed outsiders in the previous adventure. They didn’t fit in, but they tried their hardest to get people to acknowledge them. They managed to do that by the time the Wither Storm was defeated, but after the new Order was formed, they once again found themselves to be outsiders. So, their inclusion in this new group is quite interesting as the two members of the new Order are now much more sure of themselves, and the two who aren’t are still trying to prove themselves. This split in the attitudes of the cast changes the tone of the game, as everyone was more or less on equal footing before. But now with this split, the two outside the Order feel out of place, even more-so than before. That's the crux of this episode, as it is mostly about the relationships between the characters. While the first arc had a big bad that needed to be vanquished, the enemy in this episode is strictly human. As such, the voice performances are more important than even before. Thankfully, the voice cast delivers. The returning actors are excellent as usual, and the actors for the new characters deliver performances that compliment the regulars quite well. The music and art style once again compliments the story and the performances of the actor beautifully. As this is a new story, the choices you make primarily matter only within this narrative, for now. However, the long wait between episodes is worth it, as your choices make much more noticeable changes than in previous episodes. There isn't a lot of puzzle solving, compared to previous episodes, but the choices and consequences are handled well. Additionally, now that the three episode Adventure Pass downloadable content has been announced, it is possible that your choices will make a difference in future episodes as well. Overall, the fifth episode is a worthwhile addition to the main game. The evolution from the old Order of the Stone to the new is explored, albeit briefly. The main crux of the game is the split up group dealing with the relationships between themselves, as well as the relationships of their peers, now that they have become heroes. It's a mostly standalone title, except for a cliff-hanger at the end that sets up the events of the downloadable content. In that way, it might seem like an advertisement for future episodes to some. However, the choices and consequences are handled well, the new locations and characters are fun, and the music and voice acting is handled very well. It doesn't quite live up to the adventure and suspense of the previous episodes, and the puzzle solving is lacking in comparison, but the episode should please fans of the series.